Kimberli Russell is an amazing woman. She is the wife of now retired NBA player Bryon Russell and a mother to 3 lovely children. She placed her career goals aside to be a stay-at-home mom and to support one of the greatest shooting guards ever in the NBA. Now she is a cast member of VH1’s Basketball Wives, Season 2, with executive producer Shaunie O’ Neal. But the dynamics of Kimberli doesn’t stop there! This educated, bright, spirited woman believes in empowerment. As a philanthropist she gives back to children and women affected by abuse. As a board member of Women of Vision Alliance (WOVA), founded by Bernadette Holder, she is furthering the empowerment of women and helping to strengthen their vision and she also hosts a program call WOVA Cafe on Blogtalk Radio. Additionally, healthy living is a major part of her life and she is helping others achieve that as the Owner of Faith N Fitness: Mind, Body and Soul as a life and fitness coach. 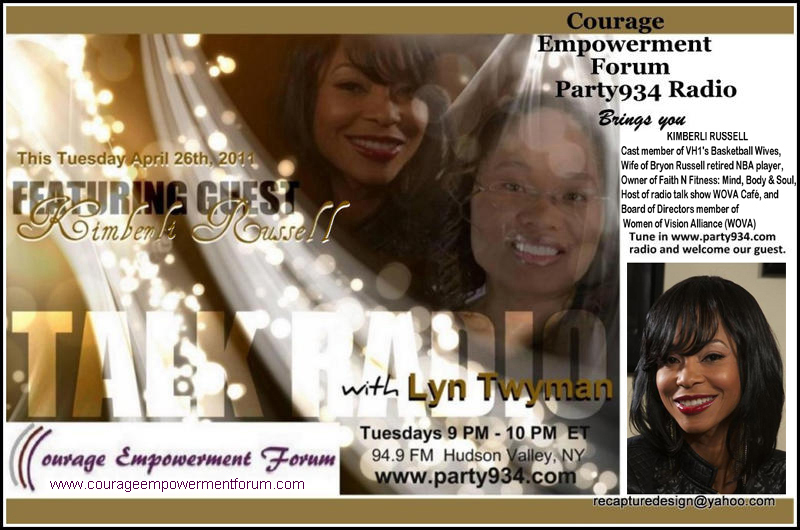 Tune in Tuesday, April 26th at 9 PM Eastern, 6pm Pacific to www.party934.com, 94.9 FM Hudson Valley, NY to hear Kimberli Russell of VH1’s Basketball Wives and Owner of Faith N Fitness for this broadcast of inspiration. Visit Kimberli’s website at www.kimberlirussell.com.